Bus Transportation is provided for students living outside the 2-mile zone on a first-come first-served basis. The 2-mile zone is determined by drawing a radius line from the entrance of the school to the student’s home or entrance of their subdivision. We use primarily “Area Stops” where parents will need to drive their students and wait for the bus to arrive. Parents are required to formally request bus transportation—by submitting a Bus Transportation Request form--and be approved by the Transportation Coordinator before their student(s) may board a TSMS bus. Students residing within the 2-mile zone are not eligible for bus transportation. 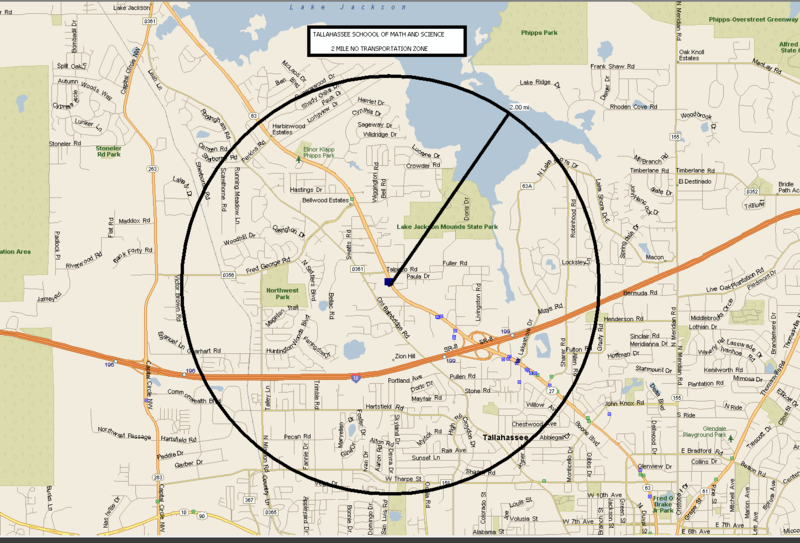 Please see the 2-mile No Transportation Zone Map below if you’re not sure whether you live inside the 2-mile radius circle. TSMS contracts with School District Services (SDS) to operate two bus routes, designated as Red and Blue. During the AM or PM Runs, if you have a problem or emergency, please call the SDS Dispatcher as he has direct radio contact with the Drivers. The SDS number is: (850) 264-0110. If you have any other question or bus-related problem, please call the TSMS Transportation Coordinator, Mr. Froemke, at 850-681-7827, Ext 304. According to the Florida Department of Education, students and parents are responsible for safety and proper behavior when going to and from the stop and while waiting for the bus. More specifically: Parents are responsible for the safety and supervision of their children from the time the children leave home in the morning until they board the bus, and at the end of the day from the time the school bus departs the unloading area until the children reach their home. Please coordinate with other parents to ensure an adult is present at the bus stop every day. It is imperative that parents or approved guardians arrive on time to drop off or pick up students at their assigned bus stop to avoid unsupervised students left in public areas. At the discretion of the driver, young children will not be left unattended at an Area Stop and may keep the child on the bus if no one meets the bus. An effort will be made to contact the parent to arrange pick up. If this fails and depending on the time, the driver—at the end of his/her runs—may return to school and place the child in the Extended Day Program (EDP) for which there is a fee or take the child to the bus compound to await pickup. Always use your designated stop and discuss with your child the best route to and from the bus stop. Talk to your children about safe bus behavior and review the Bus Safety Rules & Procedures to follow. Students may not get on or off the bus at any location other than his/her regular designated bus stop. If a situation occurs in which your child will need to get off or on the bus at another existing stop, parents or guardians must send a note to an Administrator or the Transportation Coordinator for approval in advance or early in the day. If the request is approved, the driver will be notified. The driver has the authority to assign students to certain seats if necessary to promote order on the bus. Misbehavior on the bus is handled separately from other discipline issues at school as outlined in the TSMS Student Handbook. The driver may issue verbal warnings and written referrals for violations of these rules. The principal (or designee) may suspend a student from riding the bus for serious rule violations or repeated minor violations. If you have bus-related concerns or issues, please contact the Transportation Coordinator and/or arrange a conference with your driver through the school but not at the bus stop. In the morning leave your house in time to be at the bus stop at least 10 minutes ahead of the scheduled bus arrival time. Always walk to and from the bus stop and use caution. If there is no sidewalk, walk against traffic and out of the road. Do not cut across private property. Look both ways and listen before crossing any street. If you are late and need to cross in front of the bus, wait for the red flashing lights and the stop arm of the bus to come out. Watch for a signal from the bus driver, when to cross. Cross only when all the traffic has stopped and look left and right and left again before you cross. DO NOT RUN ACROSS THE STREET. In the afternoon go straight home. Wait for the bus away from the road. No horseplay at the bus stop. It is not safe to run, play ball or tag at the bus stop. Do not run out into the street. Do not abuse, damage or litter property while waiting for the bus. Do not talk to strangers or accept a ride from any stranger. Line up for the bus and keep your hands to yourself. Never walk behind a bus. Never run after a moving bus. Don't push other students while getting on and off the bus. Take your backpack off and hold it in front of you when getting on and off the bus. When getting on the bus or getting off the bus hold on to the handrails. Go directly to your seat and remain seated. Hold your backpack, lunch box or other items on your lap. Do not place items in an area that may cause someone to trip. Keep the aisles clear. Sit in your seat properly, so that your back touches the seat, with your feet in front of you and facing front at all times. Never kneel on your seat or sit backwards. Do not lean against the bus window. Talk quietly with the person in your seat. Never shout to others or use profanity or inappropriate language. Never play with the emergency exits. Don't stick anything out the window. Keep hands, arms, and head inside the bus at all times. Refrain from disturbing the driver while the bus is in operation and conduct yourself in accordance to the Student Code of Conduct. Obey the driver and listen for instructions, in case of an emergency. Do not take things out of your backpack. No eating, drinking or gum on the bus. When you exit the bus hold your book bag in front of you and hold on to the handrail. Look left and right when getting off the bus. Walk (don't run) directly away from the bus. Stay away from the bus wheels. If you need to cross, walk 10 ft. forward from the bus, look left and right, watch for traffic. Watch for your driver to signal for you to cross. Look left and right and left again. In afternoon, go straight home. You can only get off the bus at your designated bus stop. If anything is dropped while loading or unloading, tell the driver and wait for instructions before picking it up.